You may remember that I recently started making my own soap. I was tired of all the plastic bottles that accompanied our hand-pump soaps and body washes. Between the cost of these soaps and the ridiculous amount of packaging, I was ready for a better alternative. I considered just using store-bought bar soap, but liked the idea of being able to have my own custom fragrances and fun shapes. So I decided to make my own. I ordered my supplies from Bramble Berry at the beginning of February. When they arrived, I could hardly wait to whip up a few batches of soap to try out the different bases and fragrances. I don’t have room in my house for a “soaping” space, so cold process soap was out of the question. I chose to try Bramble Berry’s Melt and Pour soap bases instead. They have several different varieties available, so I ordered their Melt and Pour Base Sampler Kit, which includes 1 lb each of seven different soap bases. The cost for seven pounds of soap was $20, and each pound makes 6-8 bars of soap, depending on the size of the mold. This works out to about 45 cents per bar, much cheaper than anything I could get at the store! 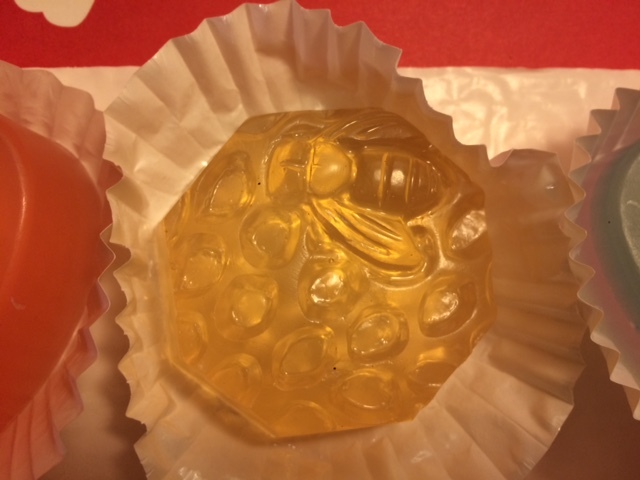 I also ordered their Bees Soap Kit, which includes a bee-and-honeycomb mold, honey melt and pour soap base, 1 oz. Oatmeal, Milk, and Honey Fragrance Oil, and 1 oz. Vanilla Select Fragrance Oil. I fell in love with the adorable honeycomb-and-bee mold the first time I saw it, and liked the idea of a kit with everything that I needed already included, to help me get started. Since then, I have been experimenting and testing the different bases and fragrances. I decided to start providing reviews of the products as I tested and used them, in case anyone out there is interested in trying their own hand at melt and pour soap making, and just wants a unbiased opinion. I am not affiliated with Bramble Berry in any way, other than being a happy customer. So here is my first review: Bramble Berry Honey Melt and Pour Soap Base. At first, I was a little concerned that the fragrance would be too strong. I am very sensitive to smells, and can get a migraine from scents like patchouli. I finally determined though that this impression was caused merely from working with the fragrances while soap making – the soap itself was very lightly, but noticeably, scented. Not too much, not too little – just right! Once the soap set, I put a bar of the honeycomb-and-bee soap in the bathroom to use a hand soap. It looked so pretty by the sink, and made the entire bathroom smell fantastic! The scent was a wonderful warm aroma, without smelling sticky sweet or being overpowering, and with very light vanilla tones. Very enjoyable, it made me smile every time I walked into the room. The honey base made a great hand soap, lathering up quickly with a rich, lightly scented lather, and rinsing away very clean. It didn’t leave any residue on my hands, or on the sink where it was placed, or in the sink bowl. I was so pleased with it that I decided to try a bar in the shower. It made my skin feel very clean, without feeling dried or stripped. The scent stay lightly on my skin after showering, just enough to be pleasant, but not enough to make people wonder why they kept smelling oatmeal when I walked by. My husband and I even tried this soap on our hair. It acted very much like Neutrogena shampoo, stripping residual shampoo or conditioner away to leave my hair feeling clean, and looking soft and shiny afterwards. After using this soap as a hand soap, shower soap, and even shampoo, I feel that it really shines as a hand soap. While it lathers well, it took quite a lot of lathering to get the amount of soap that I wanted in the shower. As a hair soap, it worked well, but again took a lot of soap to do the job. I had to rub the soap directly on my hair to really get a good lather going. I also found that if I were wearing any kind of moisturizer on my hands when I used the soap, it seemed to kill the soap’s lathering capability. However, a few extra turns of the soap in my hands would get the lather going again. In conclusion, I will definitely be making this soap again. I think the Bramble Berry Honey Melt and Pour Soap Base might become my go-to soap base for bathroom hand soap. The scents were wonderful as well, and I LURVE the honeycomb-and-bee soap mold. I would highly recommend this soap base for use as hand soap in the kitchen or bath. For more information about this base, including ingredients and reviews, check here on Bramble Berry’s wonderful website.